Thanks to Marc Jacobi for his fine report. 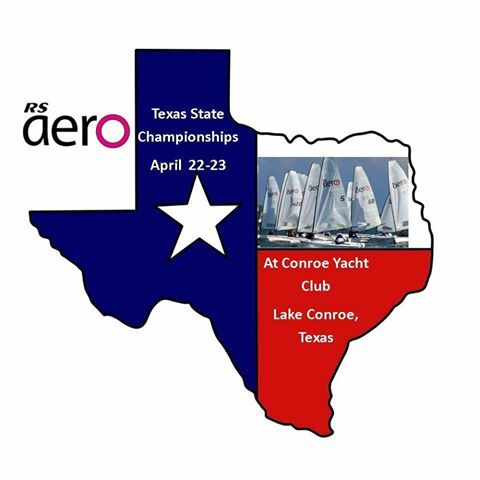 Conroe Yacht Club on Lake Conroe TX hosted the first ever Texas State Championship April 22-23, 2017. Racing took place in the open part of the lake on Saturday, with 12-20 knot winds and surprisingly big waves challenging sailors upwind, then rewarding them downwind with spectacular rides. 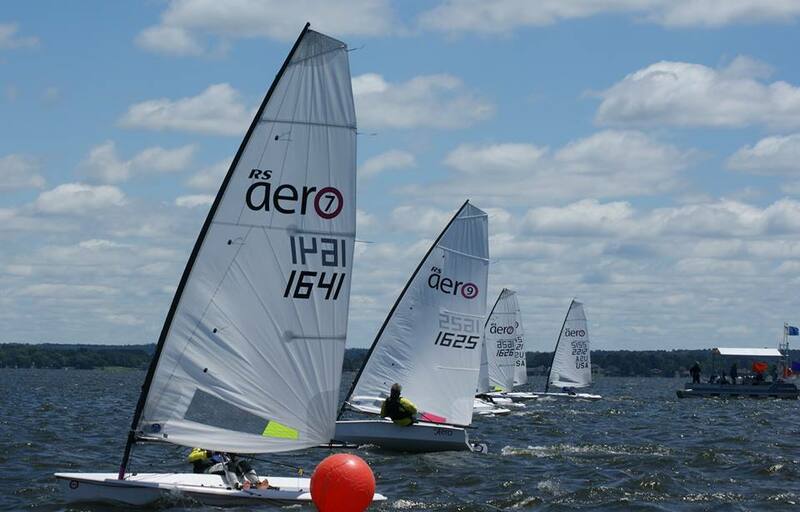 While Saturday's conditions put strong emphasis on boatspeed, Sunday's course in a more protected but shifty area of the lake required heads-up sailing and courage to excel. In all, the event was a fine test of skill and seamanship. Mike Lindstrom had his hands full as Regatta Chairman and head BBQ-tender, but still made it out for racing both days in his 9. Not the greatest conditions for an admitted light-air specialist, but he's figuring out the heavy-wind thing. Simeon Thomas gets the Sojourner of the Year award, driving 2.5 days from Colorado to hone his skills on Lake Conroe. A late-coming but passionate student of the sport and consummate gentleman, Sim is rapidly improving in speed and consistency. Watch out for this guy if he keeps this up! Like Jamie Gilman, Sim sailed a 5 due to the strong breeze and seemed to be having fun! Derek McKesson was all smiles, zooming around on a borrowed 7. The Aero sure looked sharp trailing behind his Mini too. Gotta get him into an Aero of his own! Jamie Gilman actually sailed a 5, but often sailed boat-for-boat with the fleet, especially upwind where he sometimes rounded the first mark in the top 3. The lack of horsepower hurt his pace downwind, but still, impressive performance. Jamie also prepped all the brand-new charter boats for the event and brought them in the new trailer from KO Sailing. Thanks Jamie! Ash Beatty was hoping for moderate, steady conditions to strut his stuff in his 9 and was disappointed to see neither all weekend. Enthusiasm unabated, he's a driving force in the Texas Aero scene. On his way to Bermuda to hang with the America's Cup boys, Australian foiling royalty Peter Stephinson popped by with one of his GlideFree foil sets. Pete let us give foiling a try on Friday (great fun! ), then went out and proved as quick ON the water as he is above it, nabbing 2nd in the 7 Fleet. 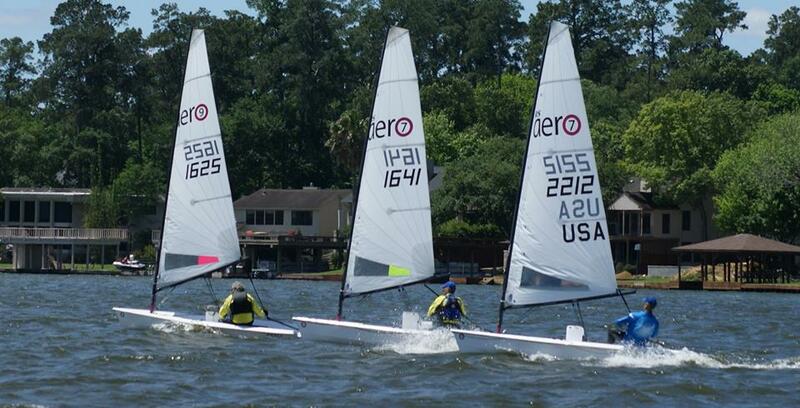 Longtime Laser sailor and coach Ryan Minth coined the hashtag #itsjustbetter after sailing to second in the 9 Fleet. Ryan quickly got up to Aero speed and had a 2 *minute* lead after three legs in Sunday's final race, only to lose it all on one big shift on the next upwind leg. Sunday was like that. Your scribe managed to prevail in the 9s, even after being scored DNF after leading the nearly hour-long Race 1 just about the whole way around. Shoulda, woulda, coulda, I didn't listen at the Competitors Meeting and paid the price! Hank Saurage had a stellar event, hanging tough in Saturday's grueling, speed-favored races and coming alive on Sunday, even winning a race (maybe two?) boat-for-boat. He won First Place not only in the 7 Fleet but Overall, to be crowned the very FIRST Texas State Aero Champion! 8 races, No drop! - those Texans are tough!